Conduct home visits and get your students excited about the upcoming school year. During the year, find out what the do for hobbies, sports, after-school activities.. and possibly attend some of these events. I promise you, if you do a least one of the above strategies, your classroom management will be much easier, calls home for positive and/or negative behavior will be much easier, and your students will be more engaged during the school year. I've always said this, but schools should be built around the library. Meaning that the school library should be regarded as the nucleus of the school. Having an amazing, dedicated, certified librarian on staff can make a huge difference to both the campus teachers and the students. Do you not get to take your class to the library every week? Then make it a mission to get down there! Do a lesson in the library, take your classes into library even if you aren't the reading/ELAR teacher. Students need to be reading and surrounded by books. Resources, manipulatives, maps, and so much more can be found right there in your school libraries. School libraries are essential to student growth in schools. Don't underestimate the power of a wonderful library, librarian, or media specialist. Also (insert @tommyspall's opinion here) let kids read whatever books they want to read. From graphic novels to fiction, to nonfiction... just make sure they have a book in their hands without restricting to standardized reading levels. This goes along with building positive relationships... but, the biggest cheerleader your students have in their lives, aside from their guardians (hopefully), is YOU! Cheer your students to success every single day! Expectation #4: "We will cheer each other to success!" My students were constantly cheering each other to success. We created a "cheer box" out of an old shoebox, and along with the standard 30+ Great Expectation cheers, we created over 20 class cheers. Whenever students did something great in class, we would let them draw out a cheer from the box and the whole class would cheer that student to success. This camaraderie and support from my students truly made the biggest impact on my classroom discipline and behavior. There are so many amazing nondigital tools and manipulatives that you can get for your classroom. From old craft supplies to things sitting around in your garage, to begging store employees to let you have all their old packing materials and boxes (don't judge.. lol).... nondigital materials for your classroom are EVERYWHERE! Seriously, my kid's favorite toys every Christmas are the boxes that the toys come in. Let your student's creativity run wild in makerspaces, and genius hour projects. 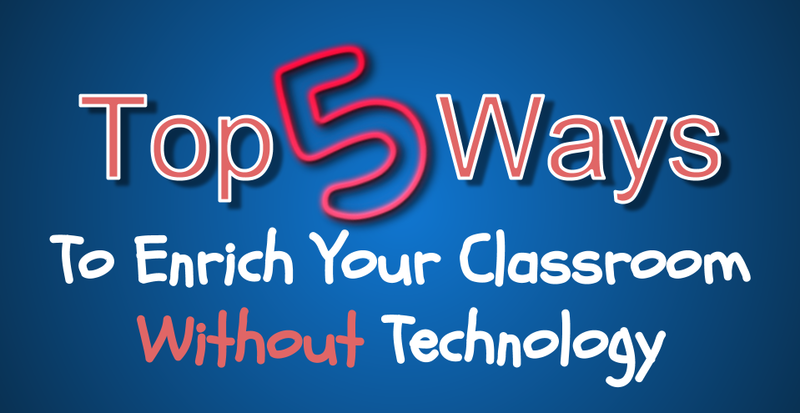 Don't always think you need technology to make engaging lessons. Classrooms just need a solid educator and tons of creativity to be successful. This was my favorite thing to do with my students. If we weren't heading down to the library or finding an empty hallway/classroom in the building to take our lessons... we were heading outside! Reading a class book? Read it outside! Talking about science, nature, area/perimeter? Take your lessons outside! Your class has the wiggles and can't stay focused? HEAD OUTSIDE! The most successful student presentations are done when they are conducted outside of the classroom. Next week, promise me that you'll take your whole class down to read in the principal's office. Or let me know that you conducted a whole writing assignment while laying under a tree outside next week. Again, like most of the top 5 strategies above, this strategy will help with behavior, discipline, and engagement.